I decided to try a raw food challenge: 1 day of raw food each week for 12 weeks. Why raw? People have reported that they lost weight and had more energy on a raw food diet… I thought that sounds good to me! • What can I eat with texture and crunch? • What tools will I need? • Will I be hungry all the time? So what’s the verdict on my experiment with a raw vegan diet? Here’s a short report: I can say that I definitely do feel better and have more energy on my raw day… it’s true! My goal is to share what’s worked for me and offer tips to make it easier for you. First and foremost, let’s define “raw” or “living” food because the category includes a lot more then salads and raw vegetables! Raw foods are classified as “raw” if they are not heated above 115 degrees Fahrenheit/ 46 degrees Centigrade. I used to believe that raw foods were super healthy because they contain live enzymes that help us digest and process what we eat. (I’d read that once food is heated past 115 degrees Fahrenheit/ 46 degrees Centigrade, these enzymes are destroyed, which reduces our ability to absorb the nutrients from our food). But after meeting Gena Hamshaw from Choosing Raw at the NYC Vegetarian Food Festival, I learned that the “live” enzymes get destroyed as soon as they hit the acid in our stomachs. Many veggies have vitamins and nutrients that are lost when cooked. So eating raw gives us more nutrition per calorie. (Note: this isn’t always true. Some veggies, like carrots and spinach, actually have vitamins that are released when cooked). Raw foods are minimally processed. And it’s a good thing to eat food that’s less processed; ideal to eat food that’s still in it’s natural package. You don’t need to be 100% raw to explore raw. Do what works for you. Make your own guidelines based on what’s available and how you feel. So, now that I decided to do this, how could I set myself up for success? I wanted to make sure I felt full and satisfied on my raw day. 1) I buy raw foods that I love so that I am really enjoying my raw day. For me, that would be avocados, tomatoes, bananas and raw cacao beans. That way when I am spreading avocado or homemade guacamole on raw “bread,” or making chocolate banana smoothies with fresh cashew milk, I actually feel like I am getting a treat! Which foods do you love and really enjoy eating? Make sure to stock your pantry with plenty of those foods. 2) I made sure I have the right equipment. The Vita-Mix makes it very easy to create your own fresh cashew and almond nut milks, as well as raw nut “cheeses,” soups and smoothies. (Plus super easy clean-up). They make refurbished Vita-Mixes that are less expensive, and you can also use a food processor (you just might need to strain through a cheesecloth or nutmilk bag). A food dehydrator is another helpful tool for a raw food diet. You can get these online, at Costco, at Bed bath and Beyond and most home goods stores. Even though you can now get good quality raw food items at the market, it can still be an advantage to have your own food dehydrator. You can control the spice levels in your own recipes and can make super yummy raw granola and veggie chips. You can get also dehydrate fresh summer veggies from your local Farmer’s Market and store them to use in the winter!! 3) If I crave something warm, I heat it – but not to the boiling point. Since the temperature threshold is about half of what it would take to boil water, I can still have soups, teas and sauces that are warm to the touch. 4) I get extra food. I found that I tend to be hungrier on my raw food day. Maybe you won’t be… but just in case… it’s best to be prepared. 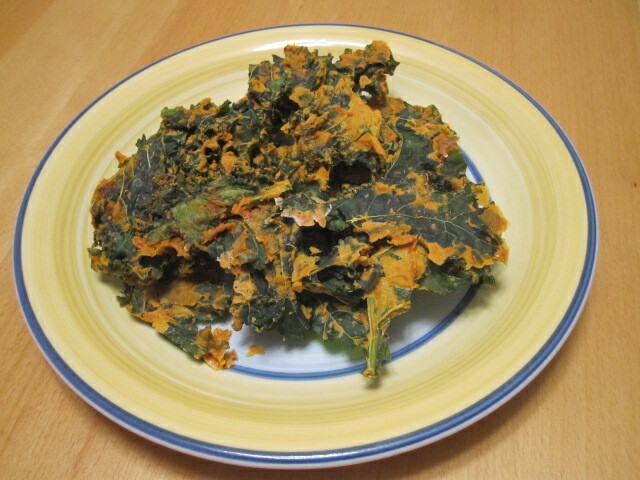 • Brad’s Raw Chips Raw Leafy Kale (Naked flavor) – super yummy cheesy kale – OMG this is good. There are also many flavors of “live” chips. I love the sweet potato ones, the kale and the sun-dried tomato. These products are all delicious. I like them so much that I’m eating them all the time now – not just on my raw day! Now you have a few ideas for raw yummy treats to keep in the cupboard. Also, think about the types of foods nuts, fruits and veggies that you love to eat anyway and stock up on these for your raw day. Try the raw recipes on Yummy Plants – they are super delish as well. If you try this raw food challenge for yourself and find some favorites, please comment below and share your thoughts with the community. I felt great on my “raw” days; it would be good to learn more about delicious and easy to prepare raw foods! I do a 75% raw week once a month. I eat two raw meals, one cooked and 1-2 raw snacks. It helps jump start my weight loss if it’s slowing and I just feel good that week.